In our quest for a weekly "Bite of the Week", we peruse every aisle of our local Stop & Shop to see what new products have made it to the shelves this week. It amazes me that there is indeed always something new. While I was looking over the prepared puddings in the refrigerator case, I saw these little blue packages stacked off to the side. Hey Laura , look at this ....brownies. Laura is the brownie connoisseur in our family. She just loves a good fudge brownie. So when I pointed the package out to her she immediately said, " bite of the week". I agreed. They were $ 2.99 for a 5.6oz. package ( approx. 12 pieces ) and there were 2 flavors available, chocolate caramel and chocolate fudge. We decided on the caramel. When we got them home we noticed they had to be kept refrigerated and did just that. Next morning, we decided to sample them. Opening the small bag, it didn't seem possible that there would be a dozen brownies in there. But there they were,12 teeny, tiny little brownies just waiting to be gobbled up. They were indeed bite-sized, and at only 60 calories each, a decadent snack. THE VERDICT: They definitely had a fudgy taste ( as they were covered with a chocolate fudge icing ) but I couldn't taste the brownie part too much nor the caramel filling. Any caramel flavor was non-existent really. Mostly it was a cube of fudgy sweetness. I think a chocoholic would love snacking on these bite-sized shots of cake but I honestly thought they tasted more like candy than brownies. Laura loved them, but not being a chocolate fan, I found them a bit too sweet. 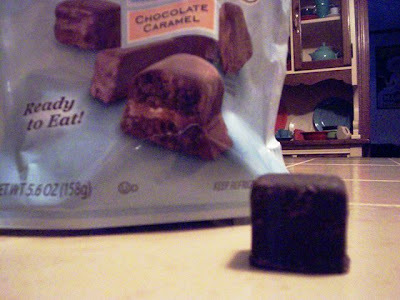 And hey, where was the caramel ? If sweet chocolaty-flavored morsels are your weakness, you have to try these little bites. 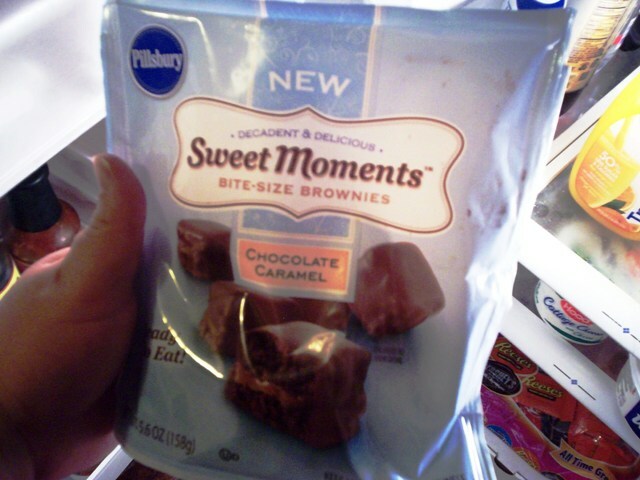 At only 60 calories each, if they keep that sweet tooth in check, it's worth keeping a bag or two around. Try them yourself and see.